Hello friends! I have finally had some time to sit down and "power blog" so I'll be catching up on sharing a number of projects that I created over the past few months but haven't shared with you all yet. This is a card I created around Earth Day earlier this year. I used the "World Love" stamp set from Your Next Stamp. To keep my card "earthy" I embossed some kraft cardstock with a woodgrain embossing folder and inked around the edges with some Distress Ink. I finished off the card with some twine and a wood button. Hello again! Keeping in the Holiday spirit, I have another card to share with you today using the ever-so-cute Walter the skating penguin stamp. Just a final reminder that Wednesday is the last day of the Purple Onion Designs Holiday Sale. You can save 25% off all stamps until December 10th!! I took a recent visit to Hobby Lobby in Buffalo NY (we don't have that chain in Canada) and I picked up this fabulous Chalkboard Christmas paper pad. I thought it would look wonderful with this penguin stamp. The sentiment strip came in the pad and I just added some white pigment ink around the edges to make it "snowy". I added some red and green card stock under my image to make the image stand out. Hello friends!! 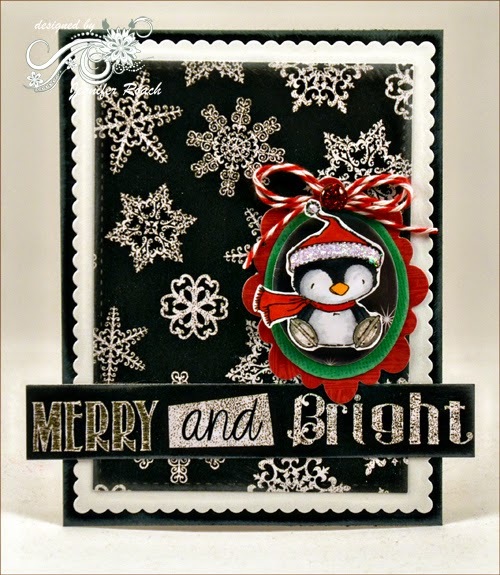 Here's another card I did with the new Stacey Yacula Holiday release stamps from Purple Onion Designs. Just a reminder that the annual holiday sale is on until December 10, 2014, where you can save 25% off all stamps!! 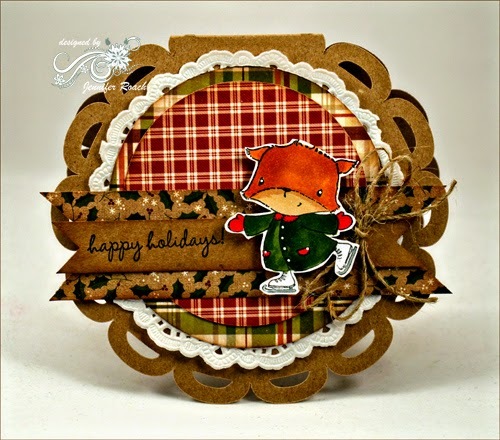 Today I have a card I created using "Henry" the skating bear and the Lighted Trees stamp. I added lots of layers of white cardstock and some clear Stickles to add some bling. It's difficult to tell from the photo but the lights on the trees also have some glitter added and they look like twinkling lights. It's the most wonderful time of the year----Holiday SALE!! Hi friends!! 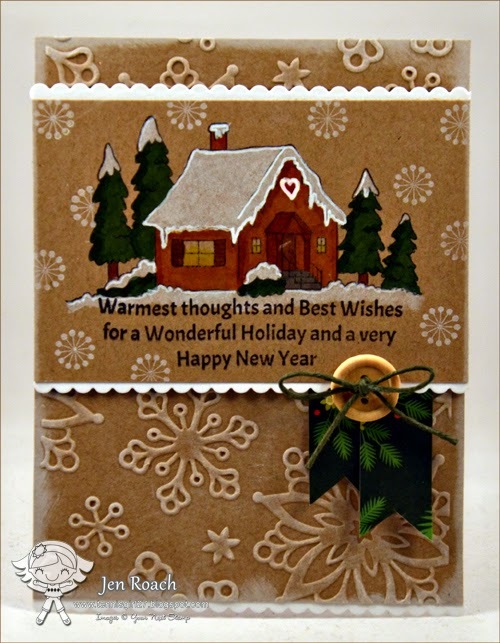 Here's another holiday card I did using the newest release from Purple Onion Designs. This is Grace the skating fox and she's skating on by to say Happy Holidays. It's also time for the Holiday Sale!! All stamps are 25% off until December 10th AND there is a special category for Cyber Monday specials just for today (December 1). Pop on over and treat yourself to some fabulous new stamps!! Hello friends! As promised I have completed my first project using the new Stacey Yacula stamps (Charming Winter) from Purple Onion Designs. I love that these pair up well with some of the older collections! I took the Lighted Trees from the new release and paired with an owl from last year's winter collection and a log from the summer collection. 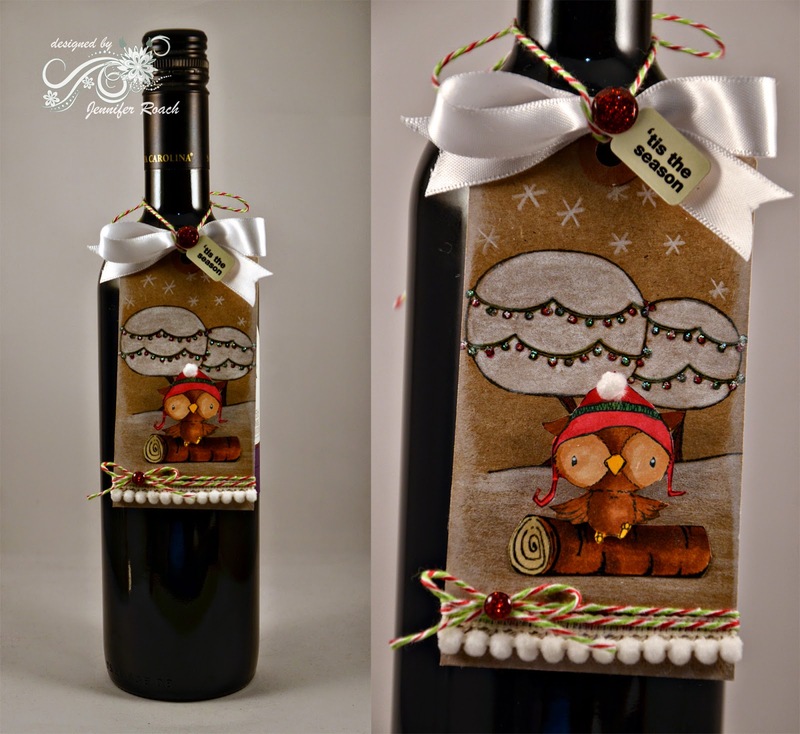 I made a wine bottle tag out of a kraft mailing tag. I coloured the trees white with my pencil crayons and Copic markers. I added some snowflakes with my pencil crayon and then my sentiment tag to the top. There are LOTS more amazing samples up on the POD blog today if you want to check them out and if you're looking for me I'll be in my room creating with some more of my new stamps!! A Charming Winter release day!! Hello friends! 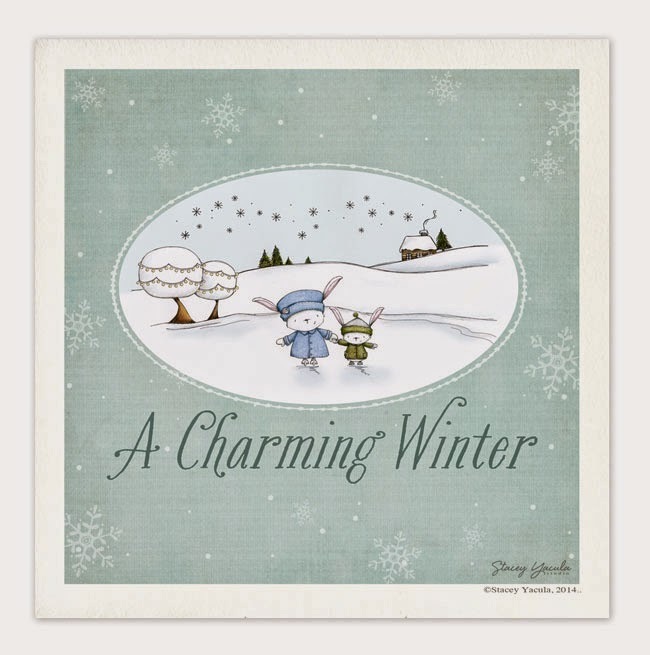 I told you last week about the new "Charming Winter" release from Purple Onion Designs. Well, today is release day and the stamps are all available on the POD website. For a limited time you can purchase the entire new release at a discounted price!! I just received my stamps this morning so come on back for some samples later this week. In the mean time you can see some of the amazing creations from the design team on the POD blog! 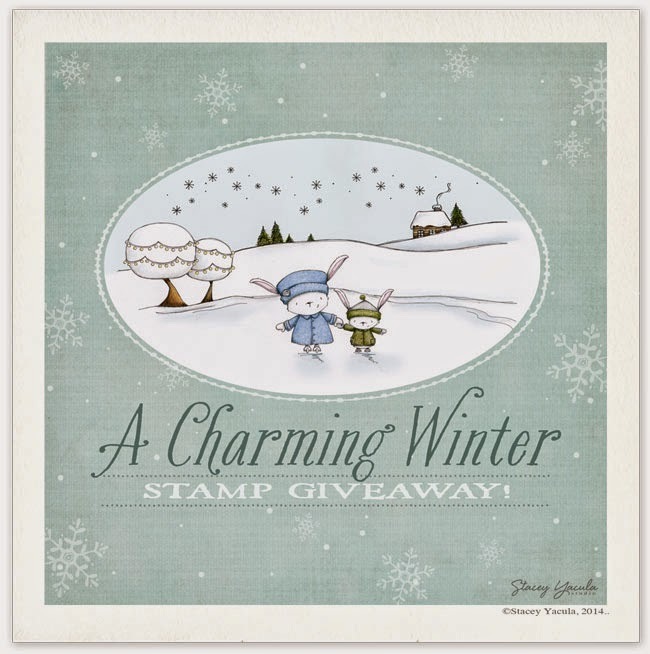 A Charming Winter --- new stamps GIVEAWAY!! There is another AMAZING new Stacey Yacula release coming up next week from Purple Onion Designs. Our favourite "critters" are back a "Charming Winter". You are not going to want to miss these. 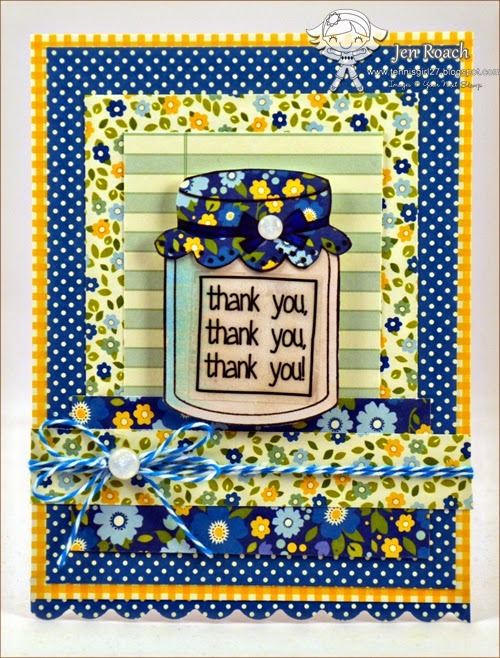 Michele is giving away some of these new release stamps on the Purple Onion Designs blog. Pop on over to leave a comment before Sunday October 26th for your chance to win. You can also visit Stacey Yacula's blog for another chance to win!! What are you waiting for.....GO!! I'll be back with some projects from the new release as soon as my stamps arrive....they don't call it snail mail for nothing LOL! It's the after release party and October feature day!! Hi friends!! For the Design Team feature post this month, we are sharing some more projects using the October new release stamps. I used the awesome new Scribbled Alphabet set on this grey themed card. 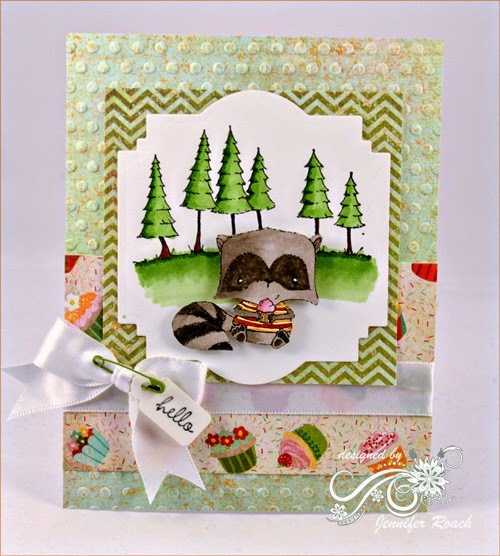 Be sure to pop over to the YNS Blog to see more Design Team creations and leave a comment for your chance to win a stamp set!! Hip Hop....it's the new and improved Your Next Stamp release day! Hi Friends! 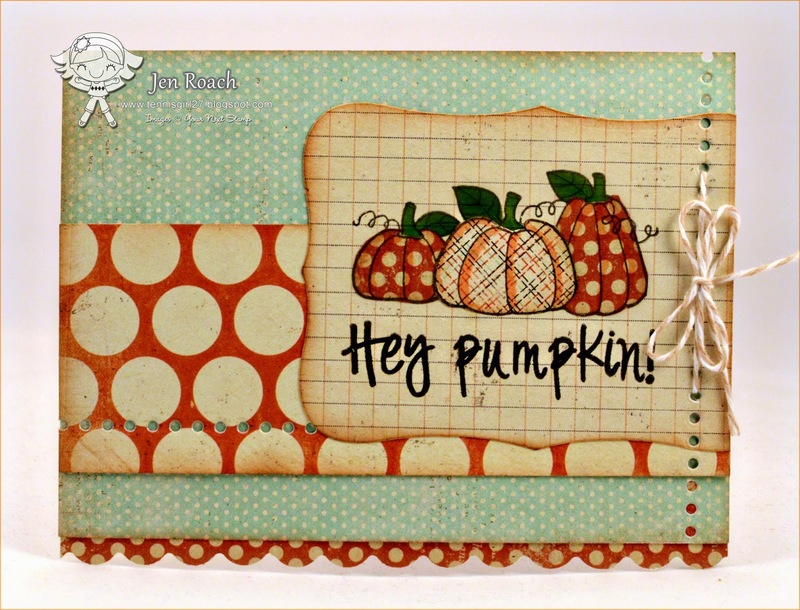 Welcome to the October edition of the Your Next Stamp new release blog hop!! Not only are we celebrating the release of a whole bunch of fabulous new Holiday stamps BUT we are also introducing the new and improved Your Next Stamp store website!! Be sure to comment on ALL the blogs (see linky list at bottom of my post) for your chance to win one of FIVE $20 gift certificates to the YNS Store. You have until midnight (EST) on October 21st to hop along and the winner will be announced on the YNS Blog on October 22nd. 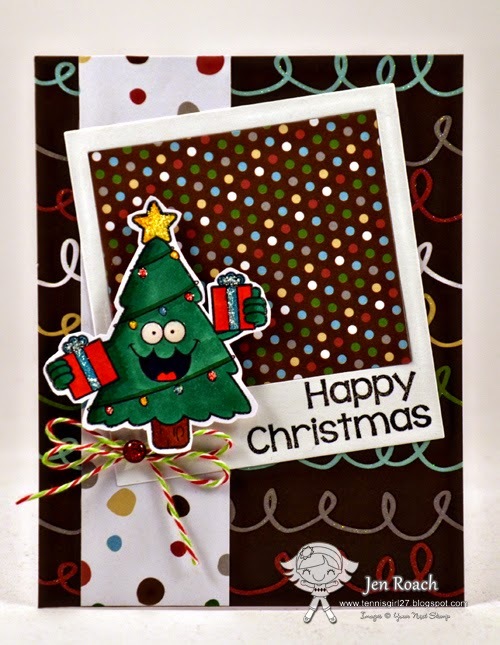 I have two Christmas cards to share with you today that I created with the super cute new Smiley Happy Christmas set. Be sure to check out all the cute images in the store as well as the matching die set. Today's Tip: When I create holiday cards I find it easier to stick with similar designs the same paper so I can produce more cards more quickly. For my set today I had some American Crafts papers and I used a similar layout so I was able to produce these cards in about half the time as if I had done them separately!! For my first card I used the Christmas tree image from the set. Once again I cut my sentiment image in half so I could place it as I wanted onto the bottom of the Instalove polariod die. For my second card I used the Christmas light image. As you can see I added some Glossy Accents over the bulbs to make them look realistic and then I raided my daughter's craft bucket for some small googly eyes. This month Karen also has some brand new YNS Gumdrops that are super duper sparkly and awesome. I added one to the middle of the my foam snowflake embellishment. Be sure to comment here before you leave. Thanks for stopping by!! Hi Friends! It's that time of month again to start sharing the new release stamps and dies from Your Next Stamp. And we are also celebrating the launch of the BRAND NEW Your Next Stamp web site! Here's a peek of one of the new images. I LOVE LOVE LOVE the sentiment that comes with this set. I stamped my image onto kraft cardstock and coloured with Copics and a white pencil crayon. I added a few snowflakes in white pigment ink to the image. The card based was embossed and then I dragged my white ink pad over the top and edges to make it look snowy. Be sure to come back tomorrow for the blog hop (and your chance to win some great prizes) and pop over to the YNS Blog today for links to all the other Design Team peeks. Wow, you can almost hear the crickets chirping over here on my blog. As always, things are crazy busy with work and family life. I haven't even been in my craft room too much in the last several weeks!! Today I have a Thanksgiving card to share. I think this is one of my favourite fall cards that I've ever made. All the stamps are from Purple Onion Designs and the fall embossing folder is from Darice. Hi Friends! 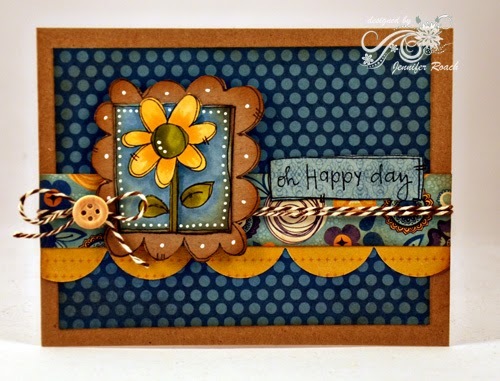 Today the Design Team is showing off some more creations with this month's new release stamps from Your Next Stamp. Pop on over to the YNS blog to see lots more great creations, and you still have time to participate in the blog hop (see post below). Today I have two mini cards I made with the new Halloween Cuties set. I also used the awesome new stitching holes die to make the template/holes for some embroidery floss stitching up the side. Hippity Hoppity Autumn is on the way!! 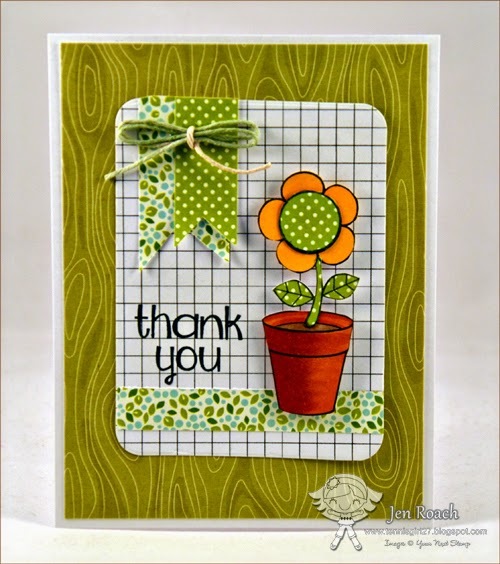 Hello and welcome to the Your Next Stamp September New Release Blog Hop! As the weather transitions to crisp mornings and the leaves start to fall from the trees, all of the YNS Design Team members are hard at work creating fabulous fall themed inspiration for you! We have a fun September lineup of stamps and dies for you this month. We know you are going to fall in love with the new dies and our harvest characters!!! If you love interactive cards, we have the perfect dies for you! Want to try splattering ink, but worried that it will look messy? Have no fear, our Ink Splatter stamp will solve that! Everything is available now in the YNS Store HERE. The hop begins on Peggy's blog and if you've been hopping along, you should have come from Kerri's blog. Make sure you hop around to all of the blogs featured in the link list located at the bottom of this post for lots of inspiration using the new products! Make sure to leave a comment on all of the blogs for your chance to win a $20.00 YNS gift certificate. The lucky winner will be announced on the Your Next Stamp Blog September 18th. I have two projects to share with you today. 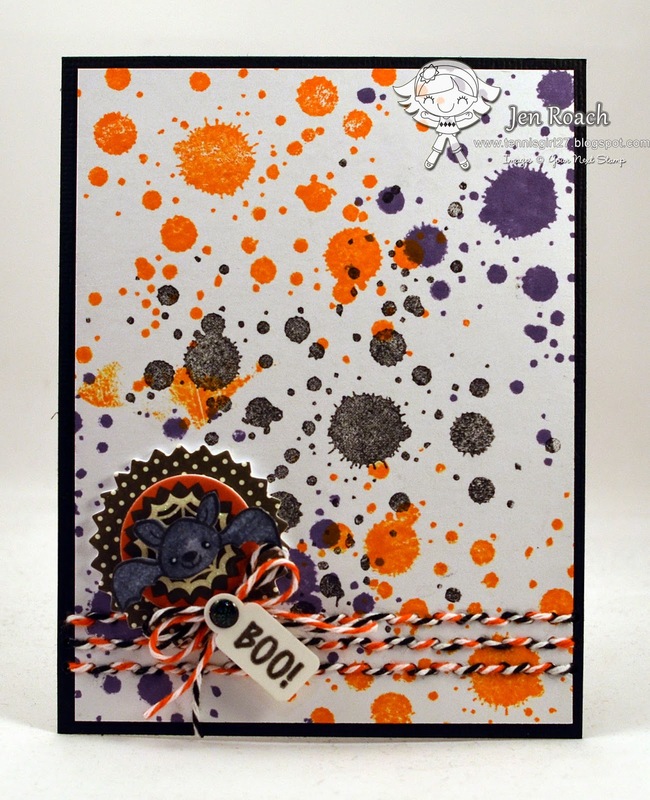 First up is a Halloween themed card using the new Large Ink Splatter stamp. I have to say I'm in LOVE this this. It's a nice clean and tidy way to make your card look messy. For this one I stamped in three different colours of ink for my card base. Also, along the bottom of this card I used the AMAZING new stitching holes die template. I hand stitched with two different colours of baker's twine. Here is a close up so you can see the stitching I did with the new stitching template. 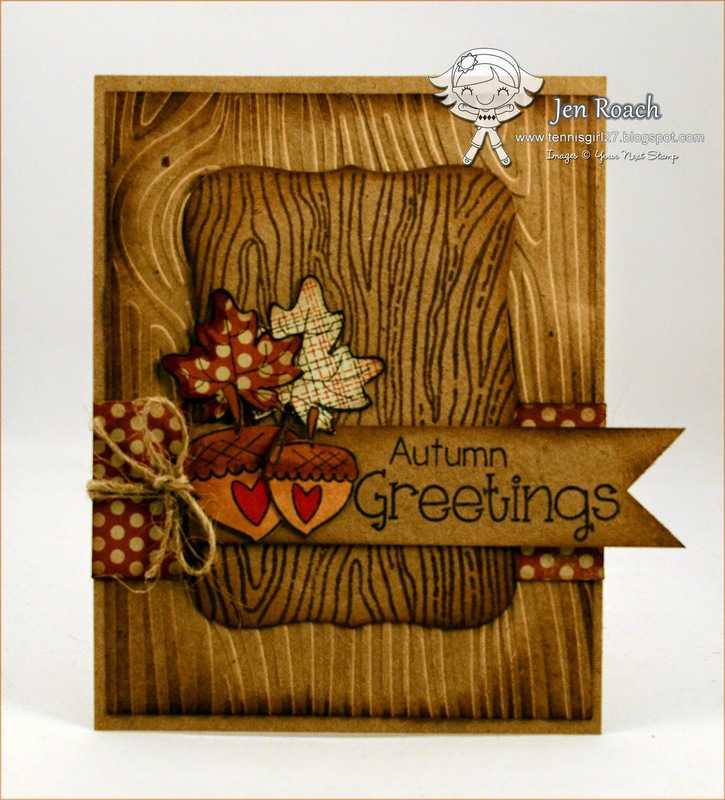 Next up I have an Autumn Greetings card with the new Wood grain stamp. 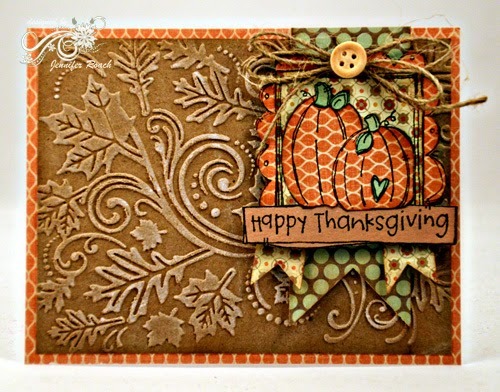 I used a few older fall themed stamps sets on this creation. Also, back by popular demand, all YNS Gumdrops will be on sale for for 25% off between September 14 to 18. Now it's time to head on over to Julie's blog, but before you go, don't forget to leave a comment. Hey Pumpkin! Time for the Your Next Stamp Sneak Peek!! Hello friends. It's almost release time at Your Next Stamp and today the Design Team is previewing some of the fabulous new stamps and dies. 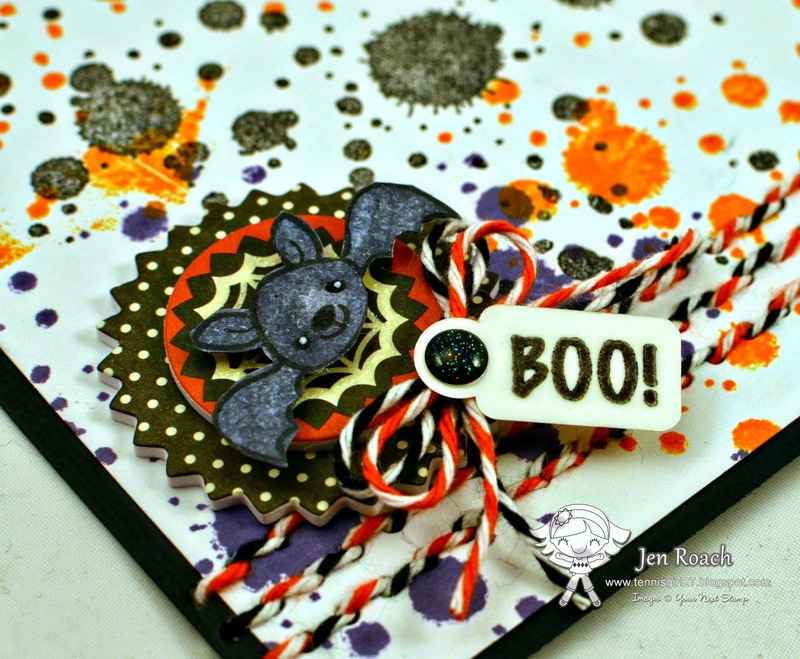 Today I have a card I made using the new Halloween Cuties and Ghostly Greeting stamp sets as well as a great new stitching template die. Be sure to pop on over the YNS Blog today to check out all of the sneak peeks and come on back tomorrow for the blog hop!! Time for the Purple Onion Designs Anniversary SALE!!! Hello friends! I can't believe summer is coming to an end already! My no-so-little-one is going into Senior Kindergarten this year.....time certainly does fly! It's that time of the year for the Purple Onion Designs Anniversary sale. 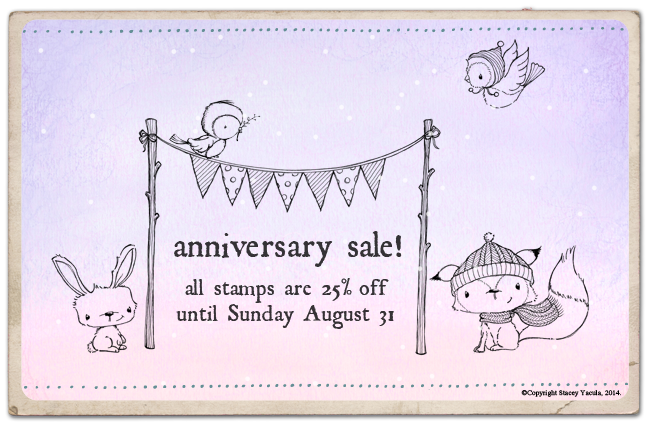 All stamps are 25 % off until Sunday August 31, 2014! It's the perfect time to treat yourself to some back to school supplies of your own. I also have a card to share today. I made this one a while back but I really love how it turned out. I used a kraft and blue colour scheme and the Doodle Frame Flower stamp from Purple Onion Designs. I used lots of inking on this to age the card and some white gel pen to accent my image. Hope you like it!! It's the after release PARTY!! Hello friends! 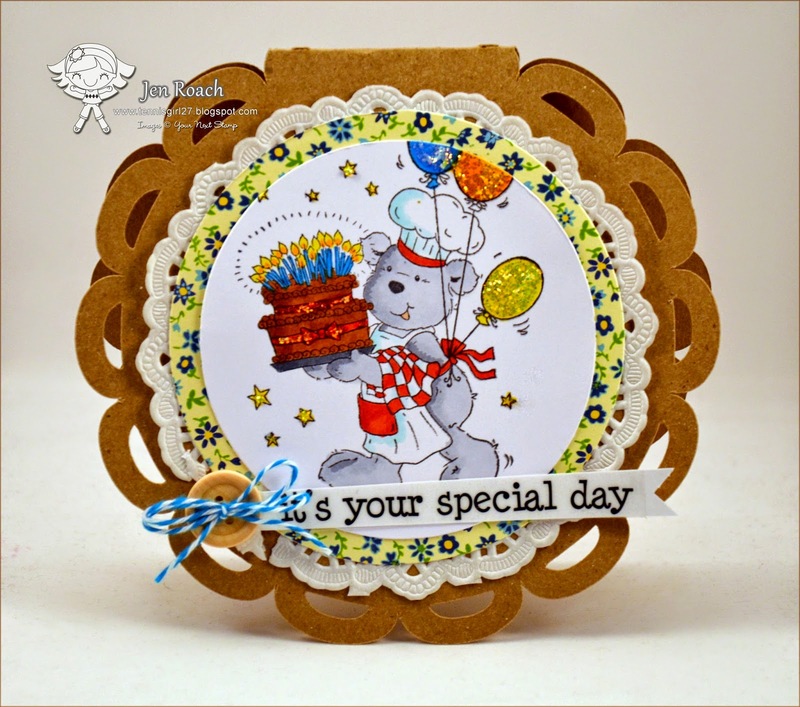 I hope you had time to check out the wonderful 5th Birthday Celebration Blog hop for this month's Your Next Stamp release!! If not, you have until the end of today to hop along and comment for your chance to win some great prizes. Scroll on down to my last post for more details. Today, the Design Team is sharing some more projects using the new release stamps. Hop on over to the YNS blog for the complete list of after party projects. Today I have two more projects using the new jar stamp sets. Yep, I'm obsessed with them!! Both of my cards were inspired by the sketch from this month's YNS Challenge. If you're new to YNS, each month there is a sketch and inspiration photo posted. Each and every Friday of the month, the Design Team shows some great samples AND if you play along you can win a great prize. Check out all the details HERE. For my first card today I used the new Mason Jars set. And for my second card I used the new Spread the Love set. I've had this Cosmo Cricket paper in my "collection" for probably a decade but I still *love* it!! The stamp set comes with the jar image and a whole bunch of fruits, label and sentiment. Such fun!! Happy Birthday to Your Next Stamp!! The rubber stamp and digital teams have worked so hard to complete some awesome projects for this combined hop! We have a fantastic line up of stamps and dies that are being released. There’s sure to be something for everyone - from adding to our Silly Monster family, to the nostalgic 60s, to savouring the sweet tastes of summer with mason jars. There’s a perfect assortment of images and dies. 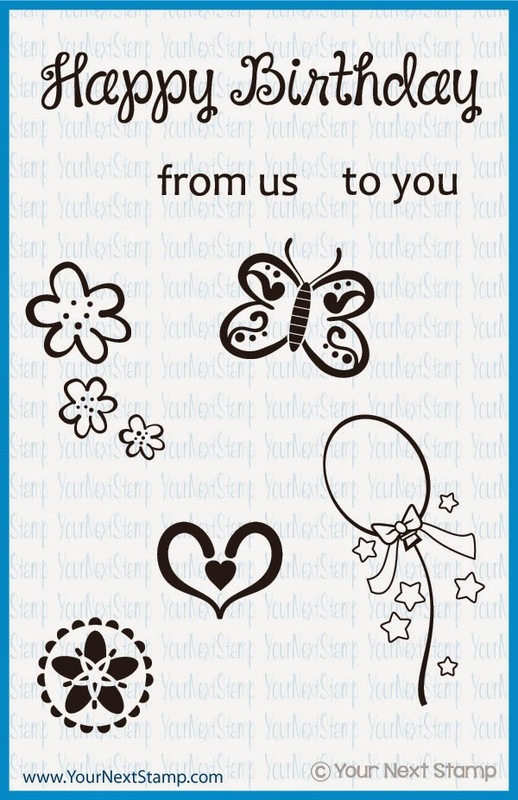 You can find all of the new goodies HERE at the Your Next Stamp Store. The hop begins on Bonnie’s blog and if you've been hopping along, you should have come from Sharla's blog. Make sure you hop around to all of the blogs featured in the link list located at the bottom of this post for lots of inspiration using the new products! If you get lost along the way, there is a linky at the bottom of my post. I have two projects to share with you today. First up is a card I created with the new Spread the Love set. I stamped and coloured a bunch of strawberries in my jar and then created the jar wrap by stamping on some up-cycled tissue paper from Bath and Body works. I cut one of the sentiments from the set in half to stamp on the tag die and blinged up the fruit with some glitter. Next I have a shaped card featuring the new Celebration Bear set. The image is a nice size so I used it as the focal point of the card. I added a pop of colour with some patterned paper on the kraft and doily background. 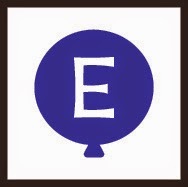 Now it's time to head on over to Deborah's blog, but before you go, don't forget to leave a comment and collect your balloon letter. Hello friends! It's that time again -- time to preview this month's new releases from Your Next Stamp! 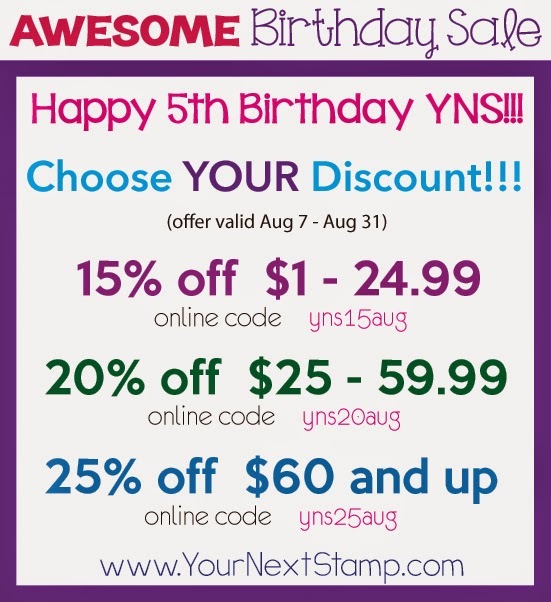 It's a very special month because we are celebrating YNS's birthday! You are not going to want to miss the hop so be sure to come on back tomorrow. 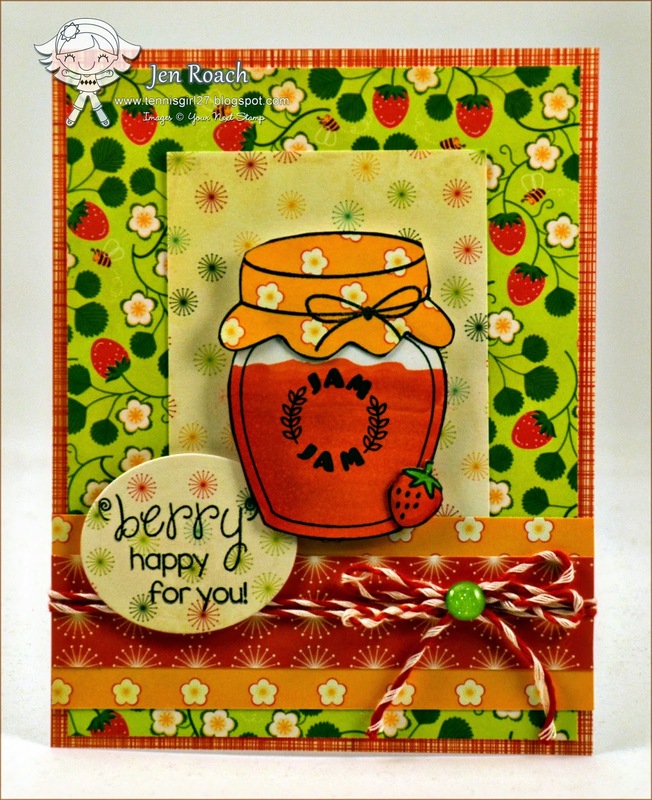 Here's a country inspired card I did with the new Mason Jars set. I used a sticker sentiment from my stash as the label and did some inking to age the image and my card. Pop on over to the YNS blog for links to all of the Design Team sneak peek posts. Hope to see you soon!! Hello Spring and a great Overstock SALE!! Hello friends! It's a bit late to be sharing a "Hello Spring" card but I'm just going through the photos of all the cards I made recently and didn't get around to sharing. All the stamps are from Purple Onion Designs. I used one of the scalloped round card bases that my Mom cut for me on her Cricut machine and used a doily as part of the background. While we are on the topic of POD Stamps, Michele has an overstock sale going on right now. There are some GREAT prices on some awesome stamp sets. Check it out!! Hope you enjoyed my card today and thanks for stopping by!! Hello! 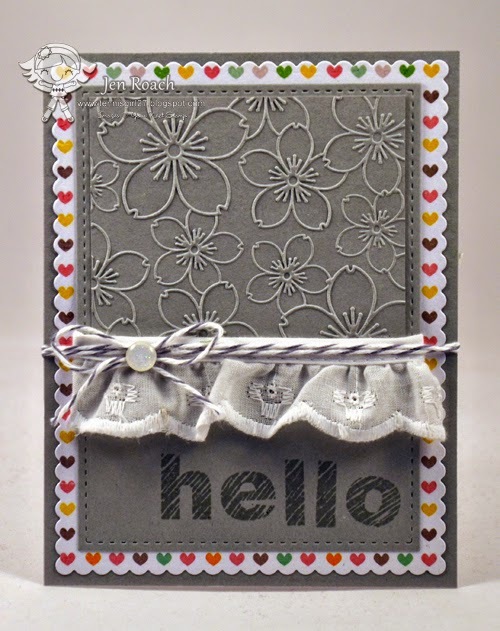 Here's a little whimsical "hello" card I created a while back but just haven't gotten around to putting it up on my blog. This is "Joey" the raccoon from the recent Stacey Yacula release at Purple Onion Designs. Oh how I love all these little critters!! I used two tones of grey to colour him and made a little scene with the tree images. The background was embossed for more texture and I attached my sentiment with a green safety pin I found hiding in my stash. I added some cupcake paper on the background to match up with the little pink cupcake he's holding. 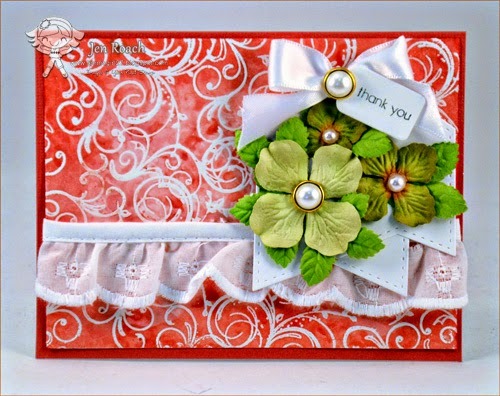 Today I have a little gift card holder to share with you that I made using the Pillow Box die set from Your Next Stamp. They are SUPER fast and easy and a nice way to present a gift card or you could even stuff some cash in there as a gift. I created my own chevron background with some brown ink and the Stripes and Stitching set. 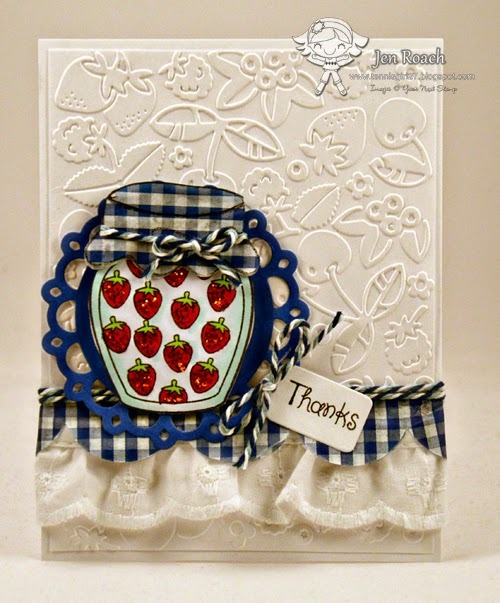 Hello and welcome to our July Your Next Stamp New Release MEGA Blog Hop. The rubber stamp and digital team have worked hard to complete some awesome projects for this combined hop! We have five new stamp sets in the store and the digi team is showcasing all the digi images we currently have. 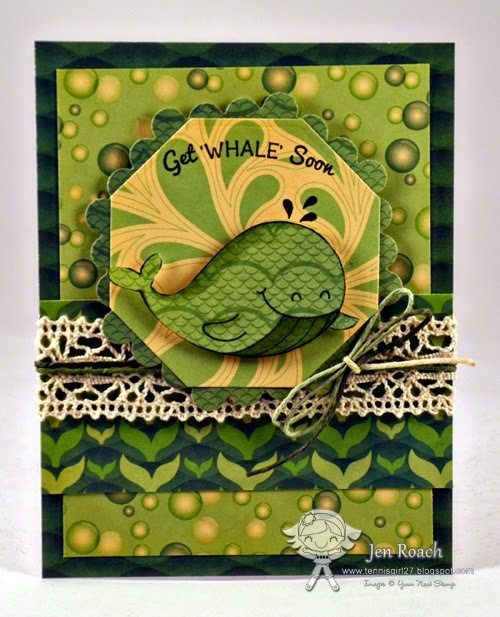 If you shore-do love sea creatures, you are going to LOVE this new release! You can find all of the new goodies HERE at the Your Next Stamp Store. The hop begins on Julie's blog and if you've been hopping along, you should have come from Deborah's blog. Make sure you hop around to all of the blogs featured in the link list located at the bottom of this post for lots of inspiration using the new products! If you leave a comment on all of the blogs, you will be entered to win a $20.00 YNS gift certificate. The lucky winner will be announced on the Your Next Stamp Blog July 10th. For my project I did a paper piecing creation using the new Sea Creatures and Sea Creatures sentiment sets. Now it's time to head on over to Anita's blog but before you go, don't forget to leave a comment. Time for a little Peek! Hello friends! It's that time of month to have a little peek of what Your Next Stamp has in store for this month's release and it's another fun one!! 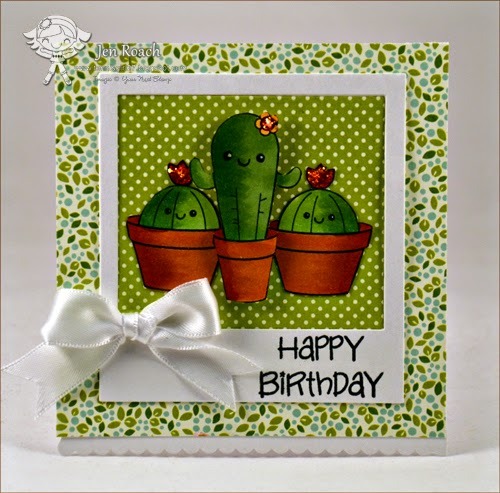 Today I'm showing you the new Cactus Flower fun set. I also added some faces using the Fun Faces set. Be sure to come on back tomorrow for the release hop and your chance to win some great prizes!! Have a Popping Good day! Hello friends! It's that time of the month where the YNS Design Team shares some projects for this month's Special Event day. 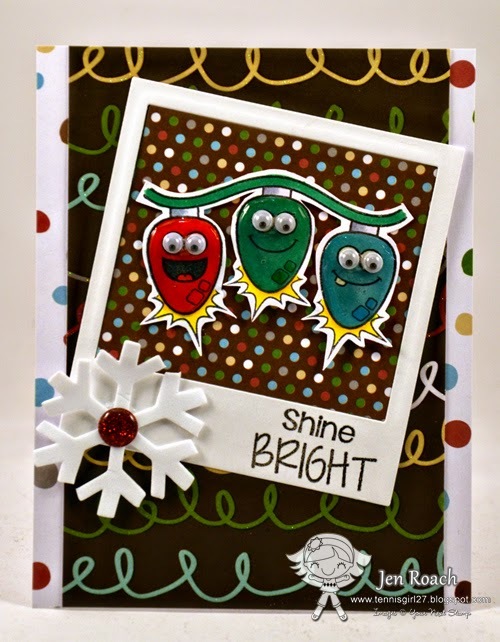 Today we are sharing projects creating using the Little Darlings stamps. I paired up this little cutie with my large film strip die. 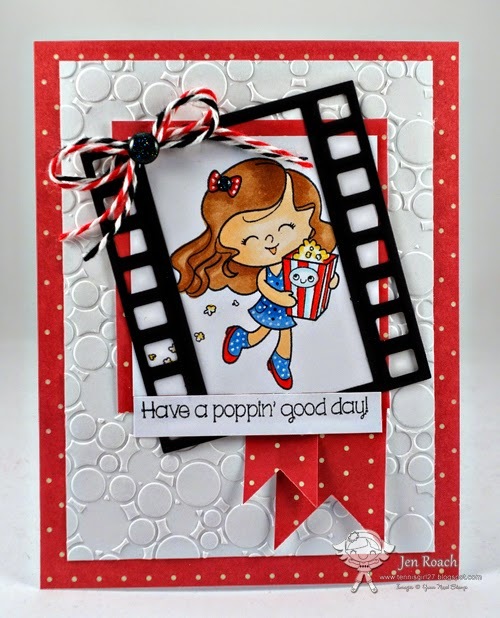 The background embossing folder also kind of reminded me of popcorn so I decided to use it for my card base. 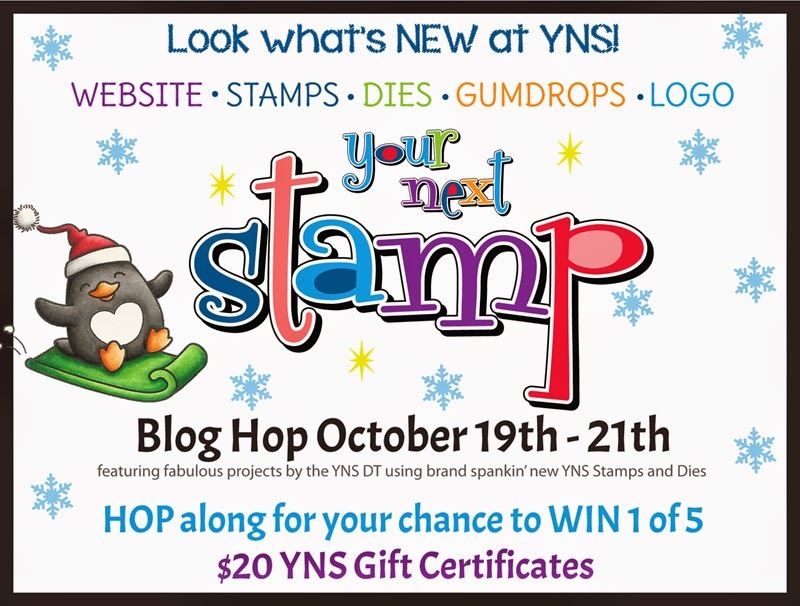 Be sure to pop over to the YNS blog to see more great projects from the Design Team where you can leave a comment for your chance to win a stamp set of your choice!! Also a reminder that is is a HUGE store wide sale going on (see banner below) AND don't forget to "LIKE" Your Next Stamp on Facebook too. Once we hit 3000 fans, Karen will be giving away a HUGE prize!!! 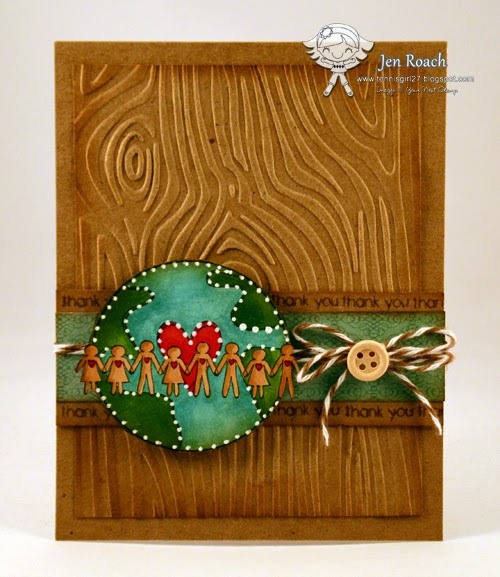 Time for the Your Next Stamp release blog hop! 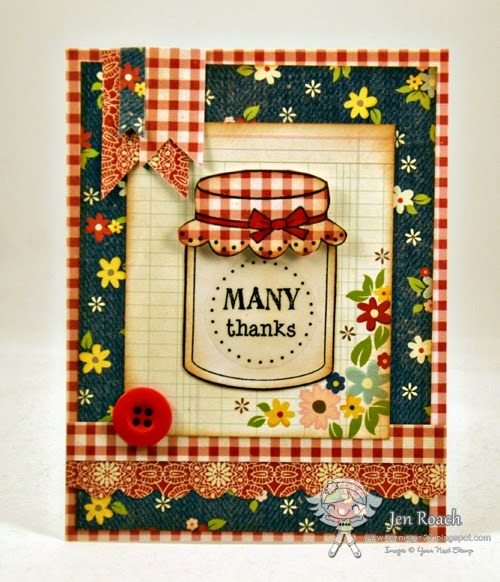 Hello and welcome to our May Your Next Stamp New Release Blog Hop! We have several new stamp sets as well as several new dies! If you love fun and whimsical, you are going to LOVE this new release! 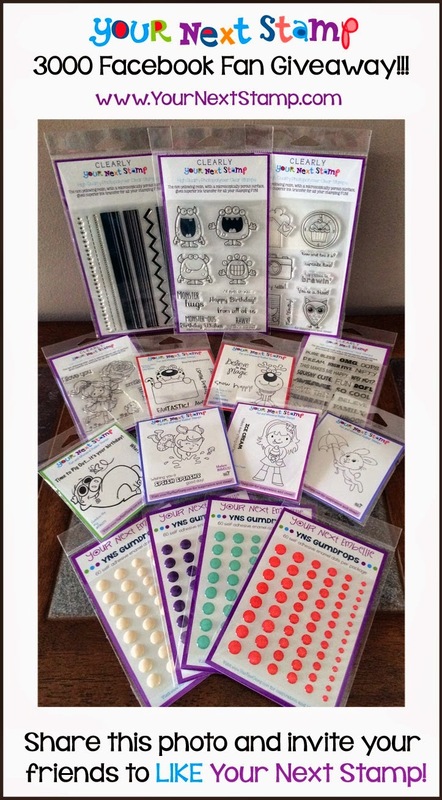 You can find all of the new goodies HERE at the Your Next Stamp Store. The hop begins on Laura's blog and if you've been hopping along, you should have come from Kerri's blog. Make sure you hop around to all of the blogs featured in the link list located at the bottom of this post for lots of inspiration using the new products! 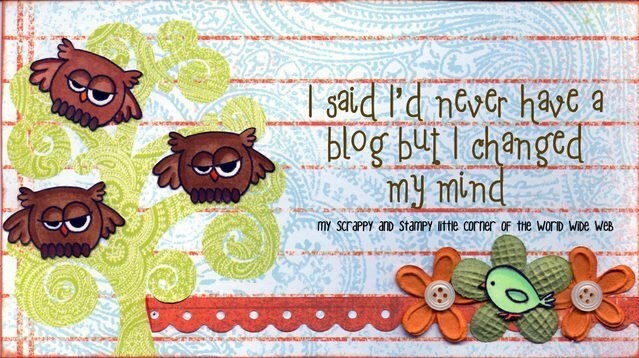 If you leave a comment on all of the blogs, you will be entered to win a $20.00 YNS gift certificate. The lucky winner will be announced on the Your Next Stamp Blog June 2nd. And now for my projects. First up, I got a little inky with my Distress Stains and the new Flourishes clear set. I stamped a bunch of the flourish images onto some glossy cardstock and heat embossed in clear powder. Then I used my Distress stains to wet the paper randomly (using two tones of red/pink) and wiped off when dry. I wanted the background to be the focal point of my card so I just added a few embellishments (well a lot LOL!) and a tag for my sentiment. 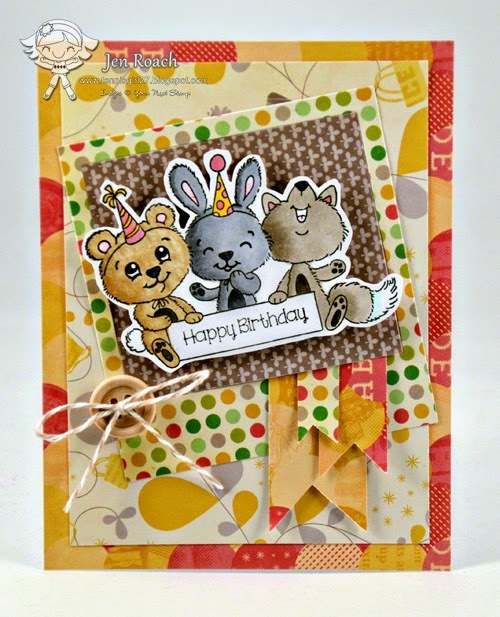 Next up is a birthday card I created using the new Birthday Animals set. The set comes with a whole bunch of cute sentiments that fit exactly in the little sign they are holding. Now it's time to head on over to Peggy's blog but before you go, don't forget to leave a comment.